Poolside Golf Game | OhGizmo! By Andrew Liszewski on 05/02/07 • Leave a comment! That pool you had installed last summer is a great way to cool off when the temperature rises but it probably meant you had to sacrifice a good portion of your backyard. Sure cutting the lawn is less of a chore now but I bet you miss the days of being able to practice your chip shots in all that open space. Here’s a unique alternative that uses your pool to make things more challenging. Just pump up this inflatable target green, set if afloat in your pool and tee off. The goal of course is to land your chip shot closest to the small flag but there’s an extra degree of difficulty since the target is constantly drifting around. The included balls stick to the surface of the green since they’re covered with “hook-and-loop tape” which is also known as velcro for those of us not worried about being sued. The floating green even has fake water hazards on it which seems kind of pointless given it’s surrounded by a real one. But if you do completely miss the target the balls will float making them easy to retrieve. 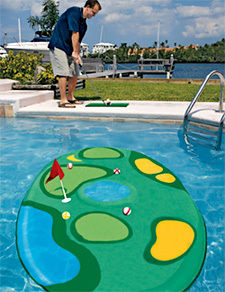 The Poolside Golf Game is available now from Solutions for $49.95.